A DEPRESSING EXPERIENCE - That's how I'd describe my visit to the City of Manchester's exhibition of prospective designs for an office block to be built on Piccadilly Gardens. The august and inspiring setting of the Sculpture Hall of the Town Hall (Alfred Waterhouse, built 1868-77) only highlighted the mediocrity of the designs. 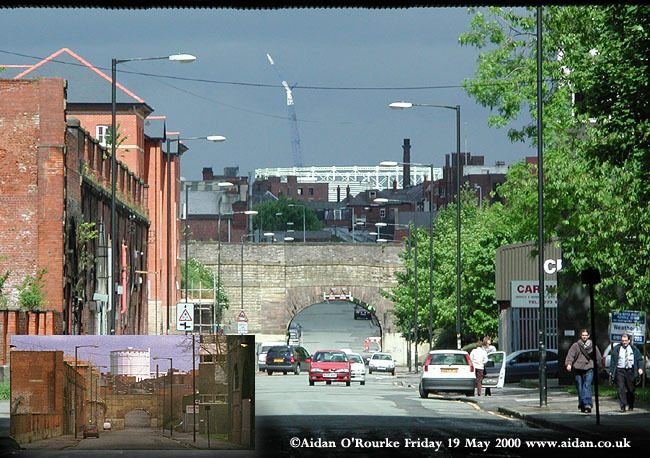 THE DESTRUCTION OF MANCHESTER - at least the Manchester of the 19th and 20th century - , continues with the disappearance from the city's eastern skyline of the gasholder at Bradford. It was an imposing and visually arresting sight rising up in a direct line of view, looking along Store Street from a viewpoint directly underneath Piccadilly Station Approach. The gasholder, built in 1931 and described as an 'eyesore' in a recent MEN article, has been out of use for over 10 years. It was decided it should be removed, in order to improve the appearance of the vicinity of the Commonwealth Games site. Eyewitness says: It should have been left standing as it's a powerful symbol of the 'energy revolution' of the 19th and 20th century, and just as significant a landmark as a church steeple or hilltop monument. It's far less of an eyesore than some structures which have been or are about to be put up right in the centre of the city. A GIANT FAN HEATER is all I can think of when I look at this multi-storey car park, which looms up on the corner of London Road and Hope Street. It's part of the redevelopment of the Grand Hotel, on Aytoun Street. I know some people think this structure is attractive, but Eyewitness thinks it's an eyesore. And zooming in on the walls, what do I see? Yellow tiles? I thought we'd seen the last of those with their removal from the Arndale Centre. Maybe they're recycling them. Multi-storey car parks are notoriously difficult things to make attractive, but it's possible. Unfortunately the architects haven't succeeded in this case. WE'RE ON THE TOP FLOOR OF THE RENAISSANCE HOTEL, off Deansgate and we're looking up along Market Street and Piccadilly, with London Road leading off to the right in the upper centre. The ugly yellow ochre tiles of the Arndale Centre (opened c1975) mar the lower left hand part of this picture, whilst the white sculpted stone of Debenhams (formerly Pauldens, built 1931) has an uplifting effect, enhanced by its art deco style hexagonal tower. In the distance, approximately two and a half miles (4km) away, we can see the Church of St Francis, Gorton, and beyond it, about eight miles away (13km) the gently rounded form of Werneth Low. People are waiting on the platform of the Market St Metrolink stop - a tram will soon come round the corner, either from Piccadilly, centre right, or High Street lower left. The buildings along the right hand side of Market Street are mostly all original, dating from the Victorian era, and before. 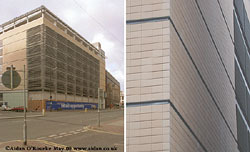 Their cousins across the street were pulled down in the late 1960's to make way for the Arndale. The route we see here, gently zig zagging to the left and the right is the ancient road south out of Manchester towards London. Since pedestrianisation in the 1970's, cars have been banned from Market St and most of Piccadilly, so it's not possible to drive along this route, as horse-drawn carriages, trams, buses and cars once did. And the integrity of this route will be further encroached upon when the local authority, Manchester City Council, implement their Piccadilly redevelopment plan. Walk-through fountains and a hump-back footbridge will be installed roughly between the telephone boxes and the the red and white bus above them. ERIC MORECAMBE was one of the best-loved comedians of the 'television era' together with his comedy partner Ernie Wise. 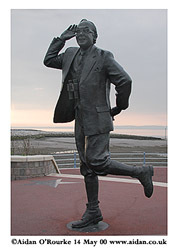 The man who named himself after a seaside town is commemorated by this statue, now a place of pilgrimage on the promenade at Morecambe, in Lancashire. It was unveiled by the Queen on 23 of July 1999. In the background we can see the mid-evening sky over Morecambe Bay. Morecambe was once called Poulton-le-Sands, but was given its present name when it became a seaside resort in the 19th century. FREE INTERNET ACCESS - AT A PRICE. Now there's a contradiction. 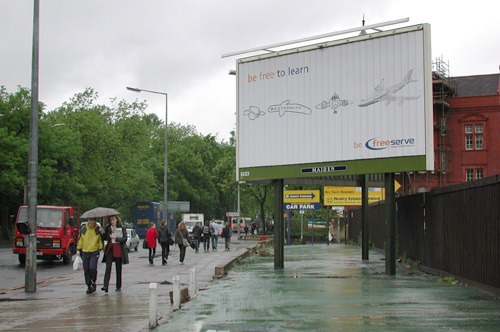 And so are these adverts, both sharing one of those automated rotating advertising hoardings on Wilmslow Road, opposite Whitworth Park. "There are five homes in Burton Road M20 without a TV licence" says the latest TV licencing advert, and the implication is: "...and if you don't get one, we'll fine you or put you in prison". These adverts can be seen all over the country, each one naming a road or street in the local area. The information presumably comes from a database of TV licence offenders. The money from the TV licence goes of course to the BBC, who in May 2000, caused controversy by choosing not to do a live broadcast of part of the Queen Mother's birthday celebrations. The BBC is affectionately known as 'Auntie' but this ad is Big Brother. 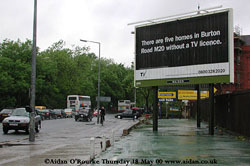 I wonder how people in Atlanta, Georgia would react if they saw an advert saying "There are five homes on Georgia Avenue Atlanta without a TV license..." And if you don't get one now, the Government will fine you or throw you into jail..."
I'm personally in favour of the TV licence, and I think the BBC does a very good job, but it's amazing that a payment system devised in the 1920's is still being used in the age of multi-channel digital tv. And as for free Internet access, in May 2000, the UK is finally starting to catch up with the United States, with BT, NTL and Freeserve all offering free internet packages. But what's the catch...? WE ARE ON DUCIE STREET, looking from the bridge over the Piccadilly Canal Basin, which, as we can see, has been drained. Work has started on the Piccadilly Basin Marina, another redevelopment project, continuing the transformation of the city centre. The warehouse on the left is one of the oldest in Manchester, built in 1830. Part of the roof has collapsed, but there are plans to renovate the building. On the extreme right is Ducie House, a warehouse converted by Urban Splash for use by creative industries, including recording studios. Check this scene again in two years time. 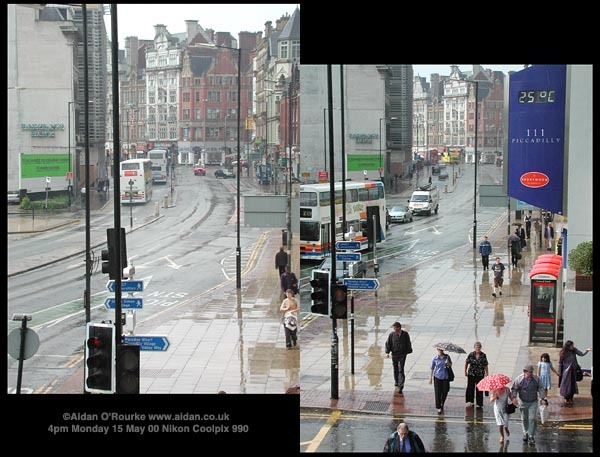 Here are two views of London Road seen from the lower balcony of Gateway House, Piccadilly Station Approach, on the corner of Ducie Street. 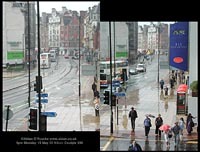 On Monday 15 May, heavy rain fell on Manchester after several days of sunny weather. In the distance we can see the corner of Piccadilly. On the right is the blue sign with a temperature display on the foot of 111 Piccadilly, formerly Rodwell Tower, built in 1962 and renovated by property developers Bruntwood in the late 1990's. Interesting to note that in the 1940's there were plans to relocate the then London Road railway station to the corner of Piccadilly. This would have entailed extending the tracks along the side of London Road, just to the right of this view. The plan never happened, but they still renamed the station Piccadilly after electrification in 1960. 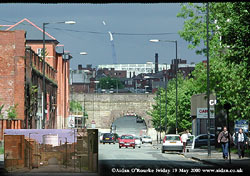 A large plume of black smoke was visible drifting over south Manchester late afternoon on Saturday 15 May 2000. I tracked it down to this factory or warehouse off Textile Street, West Gorton - off Pottery Lane, near Ashburys station. Crowds of local people, including many children, have come to watch the blaze. But aren't those kids going dangerously close to the flames? What if there was an explosion? 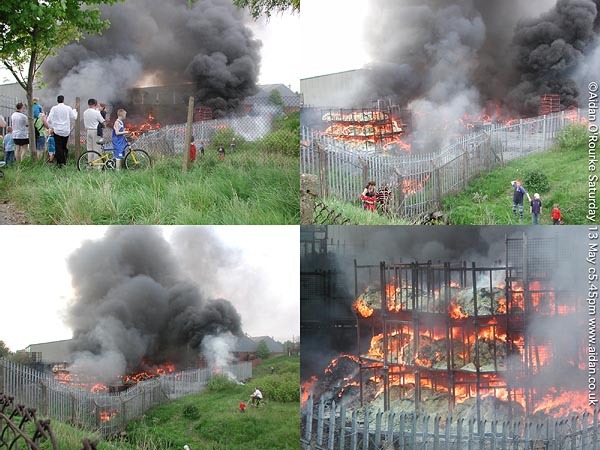 The fire service appeared to be treating this as a routine fire and didn't tell the people to move further away. On the same evening, in Enschede, Netherlands, a huge explosion at a fireworks factory killed and injured many people. Fire is a fascinating photographic subject, but it can be deadly, and I kept my distance. 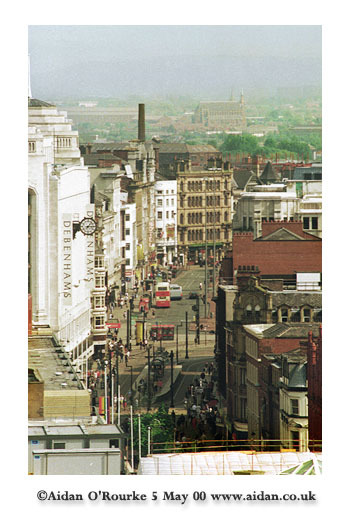 On the evening of Saturday May 2000, the weather was hot and hazy in Manchester. 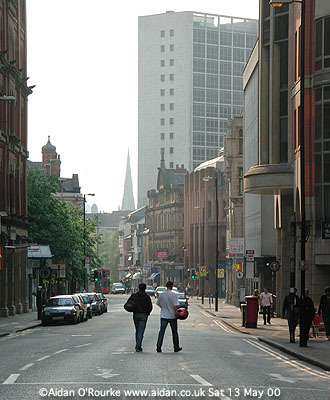 This is John Dalton Street, off Albert Square, looking towards Salford. 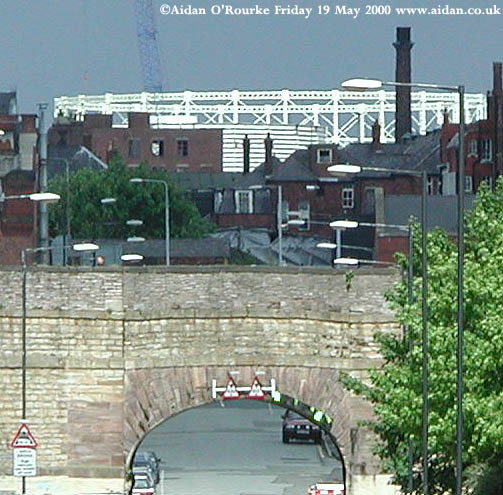 The steeple of Salford (Roman Catholic) Cathedral is visible in the distance. The street beyond the traffic lights, at the junction with Deansgate, is Bridge Street. The large white building is Albert Bridge House (built 1958), which houses offices of the Inland Revenue. Two people walk casually across John Dalton Street, normally clogged with traffic at peak hours.